Everyone is welcome at Redeemer, and we want to make your first visit simple and enjoyable; so here’s a little of what you can expect. Our Sunday morning service lasts 90 minutes (10:30 - 12:00) and consists of a mixture of worship including music, prayer, readings and reflections; announcements about upcoming events; and a talk from the Bible, which will be relevant and accessible to all. We also run activities for children. Refreshments are served from 10am and there will be members of our welcome team on hand to answer any questions you may have. We regularly host welcome lunches for newcomers to meet others and find out more about the church. Details can be found in the calendar. WHAT IF I HAVEN'T BEEN TO CHURCH BEFORE? That's fine. We were all in your shoes at one point. While there is a structure to our Sunday service, there is freedom as well. If you would like to sit during the service, that is fine. If you want to stand during a song or prayer, you are more than welcome. More than anything, we want you to know that our Sunday service is a safe place free from judgement but full of hospitality, love, and grace. We would love to answer any questions you might have about our church or what it means to be a follower of Jesus. Whatever your question, the best place to find an answer is speak to our welcome team who are on hand each week to help guests settle in. You can also email us (hello@redeemerlondon.org) with your questions before or after your visit. Redeemer kids’ work is about more than providing childcare during our Sunday service. It is about creating a space that is safe and inviting for children. Our team of DBS certified volunteers ensure each child has fun whilst making friends and exploring faith together. You are welcome to leave your little ones in the care of trained volunteers whilst enjoying the Sunday service. Parents with new babies can join in too and there’s plenty of baby gear available to make life easier. Each month we follow a new theme where we listen to a Bible story, sing fun songs, and get stuck into arts and crafts. We learn to be sociable, play nicely, and get to enjoy a healthy snack together. Packed with fun, storytelling, games, and crafts; a safe space where we are able to explore who Jesus is and why he is relevant to our lives. We let our hair down after a week of school. It’s a time to make friends, play games, be silly, share news and have our questions answered. We will read and discuss things from the Bible and learn how to search for things on our own. 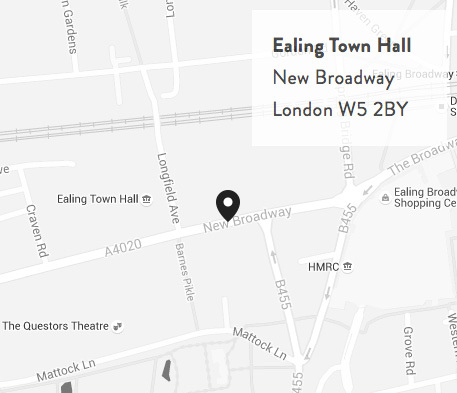 Here’s everything you need to know about finding Ealing Town Hall. Turn left out of Ealing Broadway Station exit and walk down the hill towards the Uxbridge Road. Turn right and walk for 5 mins along main high street. Once at Ealing Town Hall, you'll see our signs and the friendly faces on the door. Bus routes 83, 65, 207, 427, 607, E8, E11, E7 all stop directly outside Ealing Town Hall. The car park behind the Town Hall next to Perceval House costs £3 for the whole day, so you could enjoy Ealing’s great restaurants or shops after the meeting if you fancied it. Limited free parking is available on the Uxbridge Rd and Gordon Rd behind the Town Hall... Just be sure to check the parking restrictions! Jesus spent his life serving others: friends, family & strangers, poor and rich, old and young. We want to follow his example and serve others, whether with a meal, a lift, or a chat. We believe it’s more fun and rewarding to roll our sleeves up and get involved. On Sundays there are a number of teams that come together to make our meetings happen, from welcoming to manning the PA desk. If you settle here at Redeemer, we’d love to find out how we can serve you and hear your ideas of how you’d like to get involved. Help out on a Sunday serving team and get plugged into Redeemer life. Email serving@redeemerlondon.org to find out more.